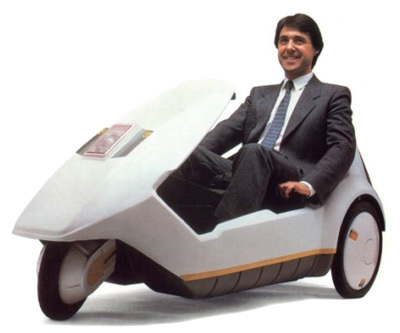 The Sinclair Research C5 is a battery electric vehicle, invented by Sir Clive Sinclair and launched by Sinclair Research in the United Kingdom on 10 January 1985. The vehicle is a battery-assisted tricycle steered by a handlebar beneath the driver's knees. Powered operation is possible making it unnecessary for the driver to pedal. Its top speed of 15 miles per hour (24 km/h), is the fastest allowed in the UK without a driving licence. It originally sold for £399 plus £29 for delivery. It became an object of media and popular ridicule during 1980s Britain and was a commercial disaster, selling only around 17,000 units, although according to Sinclair, it was "the best selling electric vehicle" until November 2011 when the Nissan Leaf had sold over 20,000 units. Sir Clive Sinclair started to think about electric vehicles as a teenager, and it was an idea he toyed with for decades. In the early 1970s Sinclair Radionics was working on the project. Sinclair had Chris Curry work on the electric motor. However, the company focus shifted to calculators and no further work was done on vehicles until the late 1970s. Development began again in 1979 and progressed erratically until, in 1983, it became apparent new legislation would alter the market and make it possible to sell a vehicle closely resembling development efforts. 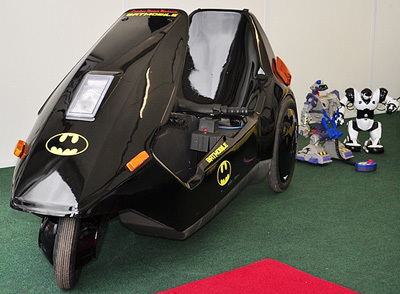 As time went on, the Sinclair Research C5 development cost gradually increased. In March 1983, Sinclair sold some of his shares in Sinclair Research and raised £12 million to finance vehicle development. In May a new company, Sinclair Vehicles Ltd, was formed out of Sinclair Research and a development contract entered with Lotus to take the C5 design to production. At the same time, the Hoover Company at Merthyr Tydfil contracted to manufacture the C5. This, together with the fact that the motors were made by Polymotor in Italy, started the urban myth that the C5 was powered by a washing machine motor. In 1984, Sinclair Vehicles set up head office at the University of Warwick Science Park. Despite promotion involving former formula one racing driver Stirling Moss, the reaction upon its release was that the C5 was impractical in the British climate meaning it was only comfortably usable in southern England in the spring and summer, and possibly dangerous on busy roads. A court case involving a drunk driver of a C5 ruled that the vehicle was a tricycle (not a car). On 13 August 1985, the Hoover Company announced the end of production. Only around 17,000 C5s had been sold. Sinclair Vehicles was put into receivership on 12 October 1985. A C5 at the Museum of Science and Industry in Manchester The C5 suffered from problems: cold weather shortened battery life, the driver was exposed to the weather, and because it was low to the ground, doubts were raised about the safety in traffic. The problems were addressed with a second battery, side screens for bad weather and a reflector on tall poles - all available as extras from the launch. The problems were expressed in a cartoon showing a C5 and a juggernaut approaching each other at a blind corner, the C5 being occupied by lemmings. Users of recumbent tricycles and a study by the Department of Transport suggested visibility fears were largely unfounded, but the weight, lack of seat-to-pedal adjustment, lack of gears, short pedal cranks, and that the motor overheated on long hills were serious problems; indeed the motor was essentially useless for climbing hills, with even mild gradients necessitating significant pedal assistance. A heavily modified C5 reached a top speed of 150 miles per hour (240 km/h) and accelerated from 0 to 60 mph in 5 seconds taking the speed record for an electric vehicle. The C5 also became the world's first electric stunt vehicle when it was driven through a 70 ft tunnel of fire. A "turbo conversion" converting the C5 to 24 volts and boosting the speed to 27–30 miles per hour (43–48 km/h) is available. During the Swiss Tour de Sol in the early 1990s, several C5s were solarised and modified to provide more range and speed. Plans were made available for these conversions, required to use the C5 legally in Switzerland. Sinclair C5s have also been converted to jet engine power. 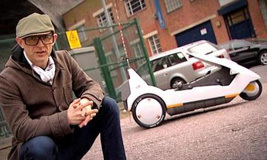 In 2006 another Sinclair C5 was fitted with a hybrid rocket engine for an episode of Sky TV's Brainiac science show. After evaluating the performance of three different fast foods as rocket fuels (combined with nitrous oxide), the winning fuel was used to propel the C5 in a drag race with an electric scooter.